Chef Anthony Caturano will reprise the tradition of “Gravy Sundays” this month at Prezza in Boston’s North End. Gravy Sundays bring together all of the ingredients needed for the perfect fix of time-honored Italian hospitality: great food and great company. This month, Chef Caturano will also add in a weekly special to join the typical Gravy Sundays’ carte du jour of: Pork Ribs braised in garlicky tomato and basil ($12); Chicken Parmigiano, tagliatelle and San Marzano tomatoes ($24); Meatballs and Sausage, creamy polenta and tomato ($24); Hand Made Potato Gnocchi and San Marzano tomatoes with basil ($18). WHEN: Every Sunday in July, except for July 4, beginning at 5:30pm. Prezza is one of my favorite Italian restaurants and I heartily recommend that you check them out. Rant: Do You Mind Paying 10X The Cost? Many of us get upset about wine prices at restaurants, which commonly can run 3-4 times the average retail cost. It seems even worse when we know the restaurant paid wholesale, meaning the markup is even higher. We feel cheated, ripped off, and don't understand why the prices are so high. It is especially galling when there are other restaurants which seem to do very well with a far more modest markup. Why can't all restaurants follow suit? Yet there are items with an even higher markup than wine. But for unknown reasons, people don't seem to get as riled up, though they might be paying as much as 10 times the usual retail cost. And they should be very concerned, as this item has even less justification than wine for the markup. I am talking about spirits, hard alcohol like vodka, rum and gin. Most spirits are sold by the shot or mixed into cocktails, and such drinks commonly cost $8-$20, and some even higher. The standard shot glass is 1.5 ounces, and there are about 25 ounces of alcohol in a standard 750ml bottle. You thus get roughly 17 shots from a single bottle, and if the restaurant charges $10 per shot, that bottle ends up costing the customer $170. That same bottle might retail for $15-$30, making a markup of 5-10 times. That markup is far worse than wine, and almost seems criminal. So where is the outrage? Why do people complain about wine prices but ignore the huge markup on spirits? Wine at least has some justification for the added price, such as its short shelf life once opened. Most spirits can last quite a while once opened and won't die off in a few days. You don't have the storage issues with spirits that you do with wine. No need for temperature and humidity controlled cellars. It seems that restaurants charge so much because people are still willing to pay the price. But why are consumers doing so? They would not go to a liquor store and pay 10 times the retail cost for a bottle of vodka. So why go to a restaurant and do that? Restaurant owners, justify yourselves. Why do you have such a high markup on spirits? Consumers, stand up and make your voice be heard. Let these restaurants know you won't tolerate this price gouging. “Lord what fools these mortals be!” cried Puck at the young Athenians’ silly behavior over love, in Act 3, scene one, line 115 in William Shakespeare’s Midsummer Night’s Dream. Instead of young Athenian men and women being wholly absorbed in their emotions, wine lovers and culinary aficionados will be absorbed in tasting and consuming at Savinos Grill Midsummer Night’s Wine Dinner on Tuesday, July 20th, at 6:30pm. Portion of the tickets will benefit The Belmont Special Education Advisory Council. Tickets are $60 per person (tax/gratuity not included). Reservations highly recommended. Please call Savinos Grill at 617-484-3499. Enjoy a midsummer night in July of exceptional wines paired with delicious food, where the courses are played out with excitement, fun and wit! I am sure remember the songs by Jimmy Buffet and now you can reminiscence to the sounds of the Buffet Man, quench your thirst and satisfy your appetite at Savinos Grill’s Margaritaville Nights. Beginning July 2nd and ending August 4th, every Wednesday 5pm-9pm at Savinos Grill’s bar, guests can enjoy the music of the Caribbean, nosh on some delicious tapas and drink some exotic margaritas from the specially made Margaritaville Menu by Executive Chef Tom Cutrone. So gather your friends, wear your parrot-head attire and enjoy the cool sounds of Jimmy Buffet songs playing throughout Savinos Grill. As far back as 2007, I have been tracking information about a Japanese manga, comic book, called Kami no Shizuku ("The Drops of God"). This manga is for wine lovers, and centers on a quest to find 12 special wines. Each of the proposed wines actually exists, including wines from regions such as France, Australia and California. This manga has been widely popular and the wines it reviews go on to sell significantly well. This manga has a weekly Japanese readership of about 360,000, which I believe is far greater than any other wine periodical out there. That does not include its readership, in translation, in South Korea, Taiwan, Hong Kong and France. An English translation may be published later this year. One reason for its popularity in Japan may be that there are few other Japanese-language wine reviews. Most of the reviews are in English, making it difficult for some Japanese to acquire that information. Plus, the manga wine reviews present the information in a fun way, without overwhelming the reader with technical details. Japanese culture embraces comics in a way the U.S. has never done. The Japanese still read their newspapers, considering that their biggest daily, the Yomiuri Shimbun, has ten times the readership of the NY Times. But they are losing some of their younger readers so bring in those younger readers, a manga newspaper has been started, Manga No Shimbun. This paper is like an actual newspaper, covering the same type of stories, but do so in manga form. Would U.S. Millenials be attracted to comics discussing wine or the news? Would such comics work to make wine seem less intimidating? There has been a great demand for an English translation of The Drops of God, but would it be able to sell wines as well as the foreign editions? Could a wine blog become successful by using a comics format to review wines? Or do Americans simply see comics as more childish than adult? After my recent visit to the Urban Grape, I stopped off for lunch at AKA Bistro, a restaurant I previously raved about. I had wanted to try their Sashimi menu but found out that it was not available at lunch, and that they had not even received their fish for the evening. At least I knew then that their fish is very fresh, delivered each day. I also found both Christian and Chris working, just as they had on my previous visit. They are certainly dedicated to their new restaurant. I sat at the sashimi bar in front of the above sign, which indicates that they are purchasing local produce, from the Blue Heron Organic Farm and Drumlin Farm, both located in Lincoln. I started off with a cup of miso soup and it was ever bit as delicious as my previous visit. Such a rich flavor, lots of savory umami. I am not sure I could ever dine here without ordering some miso. I chose to start my lunch with the Terrine de Foie Gras au Naturel et gelee au Sauternes ($18), a homemade foie gras terrine with a Sauternes gelee and some toasted bread slices. The terrine was rich and creamy with a mild saltiness. The gelee was slighty sweet with a slightly exotic tinge, and a bit of honey and apricot. A fine dish for foie lovers. For an entree, I chose the Steak Tartare et Frites ($14) is a beef tartare with French fries. On the side, I received several slices of toast, and a small jars containing mustard, pearl onions and cornichons. The tartare was quite large, and had a raw egg atop it. I am a tartare fan and this was excellent: well spiced, tender and flavorful beef. It is quite a filling dish and I liked that you got a jar of cornichons, which are a nice accompaniement. Service was ok, but definitely not as good as my first visit. My server seemed less experienced, and appeared to be a bit overwhelmed. The food was equally as good as my previous lunch, and continues to impress. I look forward to checking out both dinner and brunch. It is all a matter of personal priorities. I might spend $75-$100 to attend a multi-course wine dinner at a favorite restaurant. At times, I have spent even more for a top-notch tasting menu. Some people will be shocked to hear that I spent that much money for dinner, and would never themselves spend so much on food. Yet those same people might easily spend $100 or more to attend a sporting event or concert. Some people will travel to see the Superbowl or World Series. They might fly or drive there, stay a couple nights, and pay an exorbitant amount of money for a ticket to the event. This trip to watch several hours of a sporting event, can easily top $1000. And you could just as easily watch the event on TV. Yet those people might look askance at someone else who spent $1000 to attend a special dining event in another city. Is there really much difference between how they spent their money? Both are pleasing their senses for a limited time period and you will retain, hopefully, very pleasant memories. It is simply a matter of priorities, of which matters give us the most pleasure. As food and wine is near the top of my list, then I am willing to spend more to sate those desires. Where as someone else may care much less for food, but is a rabid Celtics fan or ardent admirer of Aerosmith, and willing to pay big bucks for an event ticket. Some might argue that the sporting events and concerts are one of a kind events, and thus different from dinners. But is that really the case? During the regular season of sporting events, there are plenty of games you can attend. The championships are an annual event, so if you miss one year, you can always go to another. Plus, they are usually televised so you don't have to go to watch them. Concerts too often occur multiple times across the country. Sure, there might be a few one of a kind events, but that is the same with food too. There are sometimes very unique food and wine events which may never be replicated and which are just as much an event as anything else. So, before criticizing someone else about how they spend their money, consider how you spend your own. Realize that people have different priorities. What are your priorities when spending money on pleasures? The dismal economic conditions have affected people all over the world, including Japanese businessmen, often known as "salarymen." A recent article in the Bloomberg Businessweek described how salarymens' spending on beer and Saké is currently at an eight-year low. They usually go out drinking about three times a month, spending an average of $46 each time, a 19% decline over last year. Interestingly, the women of the household often control the purse strings and have been giving their husbands less spending money as they have had to tighten their household budgets. This "allowance," known as “kozukai,” is approximately $443 annually, about an 11% decrease since last year, and which makes the third consecutive year of decline. So Saké consumption has likely decreased, or the salarymen are purchasing less expensive brands. This obviously does not bode well for the Saké industry, which had been relying on increased exports to make up for some of the decreased sales within Japan. But as I mentioned recently, 2009 was the first time in the past nine years that Japanese exports of Saké, including to the U.S., decreased. Hopefully the economy will rebound soon and we can see a resurgence in Saké purchases. This is the time though to emphasize value Saké, to promote inexpensive but good brands. Hopefully it will be like wine, where people generally have not stopped drinking wine, they merely spend less on it. Yesterday, I arrived in San Francisco and today I will begin a three-day Saké Professional Course taught by John Gauntner, the famed Saké expert and "Saké Dendoushi" ("Saké Evangelist"). I am extremely excited to take this course and to expand my knowledge of Saké. Plus, it will be a real pleasure to finally meet John Gauntner. Though I consider myself to have a fairly good grasp of Saké, I know there is plenty more that I can learn and experience. Plus, I may have the opportunity to taste some Saké that I have never had before. I will also be surrounded by maybe 30+ other students who are just as passionate as I am about Saké. It will be cool to chat with them, to hear their viewpoints on various Saké-related issues. For the next three days, I'll be immersed in study and tasting. Today, the class is scheduled to run from 9am-7pm. Monday it will run 9:30am-5pm and Tuesday from 9:30am-6pm (which includes two hours for the certification test). I'll try to Twitter and blog about it when I can, though a more detailed post probably won't come until later this week. This is where learning is fun. Kanpai! Have you ever gone scrumping? Maybe you have but just didn't know the term for what you were doing. Scrumping entails stealing apples from someone else's orchard. I bet a number of you have done that, primarily in your youth. The British word "scrumping" may derive from an older term "scrimp" which meant a "small or withered apple." It also led to the word "scrumpy," which refers to a style of hard apple cider most often made in South West England. I recently had a Scrumpy, though not quite the same as mentioned above. While at the new UrbanGrape wine store, I got in a discussion about hard cider and learned they carried a hard cider from J.K. Scrumpy, distributed by Atlantic Importing. I decided to buy a bottle and give it a try, also to see how it compared to the Woodchuck hard ciders. The Scrumpy actually has a lengthy moniker, J.K.'s Scrumpy Hard Cider Farmhouse Organic Orchard Gate Gold (22 oz/about $7). Let me break down that name a bit. J.K. may stand either for the owner's name, "Jim Koan," or (if you ask his wife) "Jim and Karen." It is not really made in the Scrumpy style, but is considered a "farmhouse cider" and it is an organic product. After harvest, they have a tradition of savoring a glass of cider, the "Golden Cider" at their "Orchard Gate." This cider has been made from apples grown at Almar Orchard in Flushing, Michigan. The farm is family owned, for four generations, and has about 500 acres, growing over 30 varieties of apples. They have been making hard cider on the farm since the 1850s, and the farm has an interesting history. The sale of this cider saved the farm during the Great Depression and during Prohibition, they sold their "Special Farm Cider." They currently make their hard cider using the old family recipe. This hard cider is made from only two ingredients, apple juice and yeast, and that is it. There are no other additives, sulfites or preservatives. It is also organic and has an alcohol content of 6%. After the harvest, the apples are pressed and ferment for up to six months. The cider is then allowed to age in the bottles for several weeks. The Scrumpy has a bit of a cloudy, golden appearance, due to the fact that it is unfiltered. It emits a strong and pleasant apple aroma. When I tasted it, it certainly seemed very much like an apple cider, though with carbonation and a tiny bit of an alcoholic kick. It tends to be more on the dry side, but with hints of sweet and tart apple. The apple taste is prominent and delicious, and it is crisp and refreshing. It was very easy to finish off the bottle, and I could have opened another bottle if I had it. In comparison to the Woodchuck Hard Cider, the Scrumpy is more carbonated, though still not as much as a soda. The Scrumpy also is closer in style to a regular apple cider than the Woodchuck. Which is better? Hard to say as they seem to be different styles, and I like variety. I really do like the fact that it is organic, and is only made with juice and yeast. That is a strong asset for the Scrumpy. I enjoyed the taste of the Scrumpy, and would recommend it to anyone who enjoys hard cider or even just apple cider. Classic Italian cinema, al fresco dining, picnic baskets stuffed with salumi, scoops of gelato piled high atop a crunchy cone: these are just a few of the ways BiNA osteria and BiNA alimentari are bringing the heat of summer in Italy to Boston’s very own Downtown Crossing. With its 70-seat outdoor patio, BiNA osteria celebrates the season with its inaugural Summer Series of Italian-themed nightly offerings, while BiNA alimentari continues its picnic basket program for a second summer. BiNA osteria’s Summer Series, a three-nights-a-week program running all summer long, features outdoor film screenings, live jazz and an ice cream cart offering house-made gelatos on the patio. Enjoy classic Italian films (with English subtitles) al fresco on the patio with selections from BiNA’s summer menu or Cinema Italiano menu, a $35 three-course prix fixe featuring entrees like Maltagliatti Pasta (chestnut pasta with sausage) or Chicken Breast with Grilled Portabella Mushrooms and Herbed Mascarpone. Pair classic Campari and Aperol cocktails with StuzziCare (starters) from Chef de Cuisine Bruno Ariel Guadagnin’s summer menu, while listening to live jazz performed by local artists in BiNA’s lounge. Cocktails start at $6 and the StuzziCare menu starts at $9 with selections like Clams with White Beans on Tuscan Bread in Tomato Broth, Tomatoes Stuffed with Classic Pesto and Pizzettas. Savor la dolce vita with an evening dedicated to BiNA’s house-made gelato and ice creams. Flavors range from the traditional (chocolate, strawberry) to the exotic (fig & goat cheese walnut, chipotle cinnamon & dark chocolate) and will be offered at special 2- for-1 pricing (2 gelatos for $7) from BiNA’s gelato cart stationed on the patio. Picnics by BiNA alimentari are another way to enjoy BiNA’s artisanal Italian cuisine al fresco this summer. Located a block from prime picnicking spots on Boston Common, BiNA alimentari offers fully-packed picnic lunches and dinners (complete with basket and blanket) featuring artisanal salumi and cheeses, seasonal produce, freshly baked bread and house-made Italian pastries, starting at $35. BiNA alimentari also offers customized picnic baskets where picnickers can choose items like house-made lasagna and roasted chicken with fresh herbs from an a la carte menu of to-go items. Guests have the option of borrowing BiNA’s baskets and blankets (with credit card imprint) or using BiNA’s signature orange bag free of charge. I am always interested in checking out new wine stores, especially any that are going to carry a large selection of Saké. So I was excited when I was invited to visit the Urban Grape, a new wine store located in the Chestnut Hill Shopping Center. Based on a Twitter chat with one of the new owners, I learned of their plan to stock about 30 Sakés, as well as that they would carry Sean Thackrey's Pleaides, one of my favorite wines. It certainly sounded like my type of place. Easily located on Rt.9, there is lots of parking as the store is located within a large shopping complex, next to a Star Market. The Urban Grape only opened last Saturday and I visited it this past Tuesday, on their Media Day. Numerous members of the media, from bloggers to reporters, were invited to check out the store. While I was there, I ran into a few people I knew, including Bob of The Wellesley Wine Press and Kate of The Second Glass. I know some other bloggers who visited the store at other times on Tuesday, and the feedback I have heard from them has been largely positive. I met the owners, T.J. (who once worked for Ruby Wines) and Hadley Douglas, a young and passionate couple, who gave me a tour of the store as well as answered all of my questions. They were very upfront in their answers and sincere about seeking feedback and suggestions. It was very pleasant to chat with them, and I feel they spent much time planning and thinking about the type of store they wished to own and the clientele they desired. As it is a new store, obviously everything is not yet in place and small changes are still being made. But I got a good idea of where the store is headed, and T.J. and Hadley's plans for the near future. This is a panoramic view of most of the store, which is a lengthy rectangle. They have made good use of their limited available space. It is a store of clean lines, with generally a modern flair except for a more antique-looking table near the front of the store. The left hand wall has a lengthy rack of wines, with the potential to hold up to 850 wines. The right side of the store has the Enomatic machines, racks with Saké, beer and spirits, the cashier counter, refrigerator cases and a wine cooler unit. It is well lit, so easy to see all of the bottle labels. Just to the right as you enter the store are two Enomatics, one for whites and rosés, and the other for reds. These wine dispensing machines each hold eight wines, and the selection rotates about every two weeks. All of the wines within these Enomatics are stocked near the machines so you can easily pick them up after tasting if you find any you like. There is no tasting fee for using the Enomatics and you can taste any or all of the wines. I have long been a fan of Enomatics as it gives customers an easy way to taste a variety of wines at any time they show up. How many wine stores do you know where you can always taste up to 16 wines, no matter when you show up? There is no need to wait for a specific scheduled tasting date. Instead, you always have the opportunity to taste some wine, and hopefully find something you enjoy. The Urban Grape gets kudos for the Enomatics. Just past the Enomatics are the shelves of Saké, beer and spirits. They only had 9 Sakés on their shelves, but will eventually carry about 30 different ones. That means they will have one of the largest selections of Saké in the local area, which really intrigues me. Hopefully that will help spread a passion for Saké. They will also be bringing in two Shochus, one made from sweet potato and the other from apple. That is good too as I need to broaden my tasting experience with shochu. It is a very interesting alcohol, yet it is even harder to find locally than Saké. As for beers, they anticipate eventually carrying about 200 craft beers and hard ciders, including the Woodchuck Hard Cider. That selection should be very compelling to beer lovers. They also carry a diverse assortment of spirits, and will be adding more, including some high-end bourbons (a passion of TJ), tequilas, and more. They have no plans to carry any food items, especially considering the proximity of Star Market. At the left side of the above photo, you can see a table which has flowers on top and packaged wine below. The table is located in the middle of the store, closer to the front. It holds their Urban Sampler 4-Packs, a hand-selected group of four wines priced at $50, though the actual value of the four wines might be $60-$65. These are four rather than six-packs as it is thought to be lighter to carry, closer to the weight of a six pack of beer. Plus, it is thought that most people only need four rather than six wines for many occasions. They even have cloth bags that are intended for four, rather than six wines. I own several wine bags that hold six wines, and if full, the bag is rather heavy and I do worry about it breaking. The four pack seems better in that regard. The left side of the store is their lengthy wall of wine, which has not yet been fully stocked, but can hold up to about 850 wines. In general, the wines are separated into whites and reds, stocked in a progressive style, based on their "weight" or "body." Based on TJ's palate, the wines have been grouped together, based on a ranking of 1-10, from the lightest to heaviest. This considers how the wine feels on your palate, and can be a factor in food pairing. Each bottle has their ranking listed on a back label. This is certainly a different, and less frequently used, way to stock a wine store. You are probably more used to seeing wine stores divided wines by country or grape. All methods of stocking wine shelves have their advantages and disadvantages, and this is something I will address in more detail in a separate post in the near future. TJ and Hadley stated to me that many customers have voiced compliments about their stocking system. This progressive style is intended to cater to the average consumer, who has a limited knowledge of wine. A consumer can describe to a staff member the type of wine they like or desire, and then they can be directed to wines with a similar weight. So, if you enjoy light Pinot Noirs, you would be shown similar light wines, though it could include wines from other countries and grapes. The though it that a customer will enjoy wines of similar weights. This does place a significant burden on the staff, and they must not only be knowledgeable about the store, but also wine in general. They must explain to customers how the wines are stocked, the ranking system, and help select a wine according to the customer's preferences. Fortunately, TJ seems to have understood this point and has been very careful with who he has hired, trying to get people who already possess a fair amount of wine knowledge. As many customers will also need assistance, they will need to ensure the store is adequately staffed. This is also not a store where a person generally will pop in quickly and grab a bottle. It is intended more to be a place to spend some time, to learn a bit about wine, and to find wines that you might enjoy. Due to the store's location, in a larger shopping complex, it is a place where people can easily find parking and thus spend more time within the store. This contrasts to those wine stores with limited parking where customers often have only a few minutes to spare. Such wine stores probably could not sustain doing a similar progressive style. For a more knowledgeable wine lover, the progressive system might cause some issues. For example, if you wanted to view just the wines from Spain or just wines made from Cabernet Franc, you would have to hunt through all of the wines shelves to find them, or ask a salesperson for assistance. You might not always want to seek help, or spend all that time searching the shelves. Though there are benefits to just perusing the shelves, you might not always want to take the time to do so. Though the wine wall is mainly separated into whites and reds, there are a few separate sections for Sparkling wines, Rosés and special wine promotions. Currently the wines lack any shelf talkers, and use of wine scores is almost non-existent, which is a good thing. That though is in line with the store's philosophy, which is much more for the staff to hand sell the wines, rather than to rely on the reviews of professional wine critics. Wine prices seem to be average, such as the Sean Thackrey Pleaides XVIII ($38) and the 2007 El Nido Clio ($67). About 30% of the red wines and 50% of the whites, are priced at $15 or under. They don't want people to choose wines just by cost so they placed the price on a back label, not on the front. They do have a couple of discount programs. First, you get a 15% discount for a case, mixed or the same. Second, each Tuesday afternoon, on Twitter and Facebook, they announce a wine that will be discounted 20% that week through Saturday. I really liked their selection of wine, and they carry only a small number of the "usual suspects," those common, mass produced wines that can be found in almost any wine or liquor store. You'll find interesting wines such as the Y+B Torrontes, Ravines Cellar Riesling, Kanonkop Pinotage, and Westport Rivers Sparkling wines. They carry a selection of Kosher wines and not just from from Israel. I was intrigued to see the 2007 Backsburg Kosher Pinotage from South Africa. They have a good selection of Spanish wines, including Cavas from Pares Balta and Castellar. Personally, I would like to see some wines in the store from some of the less common regions, such as Greece, and wines from smaller producers. Wines such as those though will likely show up at the store in the future. Currently, the owners have only dealt with the larger wine distributors, but look forward to doing business with the smaller ones too, so that they can provide an even more diverse selection. They have done an excellent job so far, and I look forward to seeing it get even better. For those seeking more high-end wines, you can check out the wines located to the left of the cashier counter, in a temperature controlled cooler. You'll find items such as fine Bordeaux, top-notch California Cabernet and Sauternes. Near the back of the store are the refrigerated coolers for chilled beer and wine, and the stairs in the back, off-limits to customers, lead to the basement storage area. Overall, I am very pleased with what I found at the Urban Grape and it has much potential. TJ and Hadley possess an infectious passion, and have worked hard to create a wine store that should appeal to many consumers. They have a very nice selection of wines, which will continue to improve, and I look forward to monitoring their progress. It is definitely a store which I will now make a regular stop in my travels, and I recommend that my readers check it out as well. Welcome to a new feature on my blog, Thursday Sips & Nibbles. This will be a semi-regular column where I briefly mention some interesting wine and food items that I have encountered recently. Generally, these items will be too brief for their own article, but they are worthy of mentioning. They might include updates on previous items and places I have reviewed or news about upcoming restaurants, wine stores, or related food/wine places. 1) Whenever I am dining near Boylston Street, it is very difficult to eat dessert at anywhere but La Patissier in Troquet. I have often raved about the exquisite creations of Pastry Chef Sarah Woodfine and every visit solidifies my feelings. I recently savored a new treat, the Plum & Ginger Napolean (pictured above), a towering treat that delighted my palate. There are sesame chips between the various layers which added a nice crunchy texture to the smooth and creamy fillings. Excellent presentation, delicious flavors and fresh fruit. I also got to taste the new Strawberry Souffle, and it was just as good as her other souffles, light and full of sweet flavor. If you have not eaten there yet, then what is wrong with you? 2) There is a new bakery in Melrose, the Busy Bee Bakery, located at One Hurd Street, across from the Wyoming Hill train station. Besides serving a variety of baked goods, they also serve both breakfast and lunch. I stopped by the other day and tried some of their cookies and cupcakes. I tasted their Snickerdoodles, Chocolate Chip and Double Chocolate cookies ($0.65 each). I have high standards for my Snickerdoodles and these actually did very well, a nice combination of crisp and soft, with a tasty cinnamon flavor. The other cookies also tasted very good, and seemed very fresh. The cupcakes did well too, and passed my moistness standard. Their icing was soft and creamy, and not too sweet. I see potential here and will return soon to check out more of their foods. 3) Melrose also has a new Thai restaurant, Spice Thai Kitchen, located at 454 Franklin Street. It is only take-out and delivery, and has quite a diverse menu, including some non-Thai items. I ordered some take-out the other day and it was pretty good. Not as good as Taste of Siam in Stoneham, but respectable food. I especially liked their Thai Ravioli and Siam Roti. I will be back to check out more of their dishes, especially some of the different ones such as Chiangmai Noodle and Thai Panang. 4) Continuing on the Melrose theme, Beacon Hill Wine & Gourmet at 538 Main Street, is always adding new products so it is worth checking them out on a regular basis. They recently added Woodchuck Pear Cider which I have previously raved about. Plus, they have added a Local Wine section, showcasing wines made in New England. Currently they carry Turtle Creek and Black Dog, with more wines to come. It is always good to see wine stores supporting local wineries. "Foxy" is usually a compliment, except when applied to wine. A woman who is "foxy" is considered attractive, while a man who is said to be "foxy" may be considered cunning and clever. But a wine that is foxy has an unappealing musky aroma and taste, and the term is most often used when referring to American wines made from vitis labrusca, not vinifera grapes. Hybrid grapes though often lack that foxy nature. One such hybrid is the Norton grape, thought to be a cross of the Bland and Pinot Meunier grapes. It is discussed in more detail in The Wild Vine: A Forgotten Grape and the Untold Story of American Wine by Todd Kliman (Crown Publishing Group, May 2010, $25). 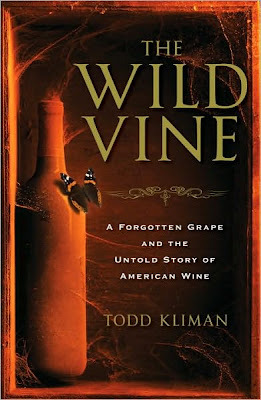 It is a hardcover book, of 280 pages, and Kliman is the Food and Wine Editor of The Washingtonian, also having authored numerous articles for many different publications. The Wild Vine presents a history of the Norton grape, from its creation in the nineteenth century to its current production across the U.S. Yet this history covers other wine matters as well, from the efforts of Jamestown through the effects of Prohibition. The book ranges from Virginia to California, with stops in places such as Missouri. You'll meet various interesting personalities, showing how the Norton gained fame, and then fell almost into obcurity. I found the book both compelling and interesting, a well-written and intriguing tale. I learned a number of things from the book, which is always a good thing. One of the most fascinating bits of trivia was the origin of the term "foxy." The original Jamestown founders tried to produce wine made from native American grapes, vitis labrusca, but found the wines often gave off a musky character that they described as "foxiness." This term has remained with us even today. The Norton grape was created around 1821 by a Virginia physician and amateur horticulturalist Daniel Norborne Norton. He wanted to create a durable, disease-resistant grape that would produce a delicious wine. And he succeeded. The grape became more popularized by a Long Island nursery which mentioned the grape in its influential catalog, calling it "Norton's Virginia Seedling." The nursery also published an influential book, A Treatise on the Vine, which gave raves to the grape. The Norton grape then spread across country, including into Missouri where numerous German settlers were planting vineyards. Interestingly, most of these Germans were originally from northern Germany, and not the wine country of the south. By 1870, Missouri, with about 120 wineries, led the nation in wine production. And in 1873, a Missouri wine presented a Norton wine at the Universal Exhibition in Vienna, winning a Medal of Merit, and being one of only three wineries in the U.S. to win such a medal. But that was a highlight which was soon eclipsed by the the growth of the California wine industry. Around 1870, Missouri had accounted for 42% of all of the wine in the country but by the turn of the century, it accounted for only 3%. California had become a wine power, able to produce grapes at half the price of Missouri. Prohibition would also do its best in hindering wine production across the country. But around 1965, there was a resurging interest in the Norton grape, and it now is planted in numerous places, including Virginia, Illinois, Missouri, Texas, Arkansas and others. Kliman spends time discussing his encounters with Jenni McCloud, the owner and winemaker at Chrysalis Winery in Virginia. Jenni is an ardent advocate of the Norton grape. Kliman also mentions that Jenni is a transsexual, though I am not sure that information is really relevant to the matter, and almost seems too salacious. The book has perked my interest about tasting some good wines made from the Norton grape. I was able to ask Kliman, via email, about which Norton wines he has tasted and enjoyed. Though he does not have detailed tasting notes, he has tasted Norton wines from Arkansas, Illinois, Missouri, Texas and Virginia. His favorite Norton wines came from Chrysalis (Virginia), Stone Hill Winery (Missouri), and Adam Puchta Winery (Missouri). If you enjoy wine history books, I would definitely recommend this book. It illuminates a grape that is very American, yet which many may not have encountered before. It is well-researched, easy to read, and informative. Has anyone else read this book yet? I have been eagerly following the progress of AKA Bistro, a new restaurant in Lincoln. It is a joint venture between Christian Touche, the GM who assisted in opening Ken Oringer’s Clio restaurant in Boston, as well as managed it for 12 years, and Chef Chris Chung from Uni. They serve both Japanese sashimi and traditional Provençal fare. I was very pleased to see both Christian and Chris working at the restaurant when I stopped by for lunch. They are taking a very hands-on approach to the restaurant, and that only bodes well for the potential success of the restaurant. When I arrived for lunch, my dining companion and I were the first to be seated but by the end of the meal, the restaurant was nearly filled to capacity. It seemed to be a very local crowd, including some regulars. The sashimi bar area was only lightly occupied, though that is where I want to dine the next time I visit. The Provençal menu is like a traditional French bistro, with a good assortment of Appetizers ($10-$18), Soups & Salads ($5-$12), Entrees ($14-$28) and Sides ($6). You can also order the Menu du Jour ($22), a three-course meal. There are a few items on the Provençal menu from the Sashimi menu, such as Hawaiian Poke. I should note that a number of the ingredients on the menu come from local farms. Prior to your food starting to arrive, you receive a fresh French roll with soft butter. The bread has a nice, crusty exterior and a soft interior, and you are offered more rolls during your meal. An excellent choice of bread, which also is good for sopping up sauces and broths during your meal. Our lunch began with a cup of Miso Soup ($5), which has scallions and hijiki seaweed. At first I thought our server was bringing a cup of hot tea, but it turned out to be the soup. You don't receive a soup soon, and are expected to drink the soup. The soup is made from scratch each day at the restaurant, and I have to say it was one of the best miso soups I have ever tasted. It was bursting with flavor, lots of that savory umami taste. It made many other miso soups seem watery and bland in comparison. Each sip of the soup was a delight to my palate, and I could easily have drank a much larger cup. Next, we had a couple appetizers, including the Rock Shrimp Tempura ($14) with XO sauce aioli, fried shallots and prosciutto dust. I really did not consider this to be tempura, which I believe should be a very light and crispy batter, but it was still a delicious coating, with a nice crunchiness to it. The batter was a bit thicker than usual tempura. Taste-wise though, this dish was very good, with an interesting sauce that complemented the shrimp. Our second appetizer was the Croque Monsieur et Salade du Jardin ($11), which is supposed to be an open faced sandwich. It is not, being an actual sandwich, but that minor quibble can be easily ignored because this sandwich is exceptional, as well as being larger than you would expect an appetizer to be. You could easily order this sandwich for lunch and be quite satisfied. From the first bite I was enamored with its taste, fresh, savory and full of tender meat and lots of cheese. It was grilled perfectly, not over-done in the least. I love Croque Monsieur sandwiches, and this rates with the best. As for entrees, the Coq au Vin ($14) was a very good choice, with plenty of tender, moist chicken mixed in with fresh veggies, with a side of buttery pasta. The chicken easily came off the bone, and the skin was crispy and flavorful. The dish was certainly good-sized and would easily sate your appetite. We also had the Moules Frites ($15), mussels steamed in white wine served with French fries. There was a large portion of mussels in a light white wine broth, perfect for dipping some of my bread. The mussels were tender and clean, lacking any grittiness. The fries were crisp and tasty as well. For dessert, we shared the Strawberry Tart, which was excellent, with plenty of fresh, sweet strawberry slices and a crunchy pastry shell with nuts. The filling was creamy and delicious. A fine way to end the meal, even though we were both quite full after our meal. Service was excellent, with our server being very attentive without being obtrusive. The food was excellent, with a couple items being superb, and quantity size was very good. You are not going to leave here hungry. I had high hopes for this restaurant prior to my visit, and my initial visit lived up to those hopes. The fact the restaurant was nearly packed for lunch also indicates this is a very popular spot. I will definitely be returning and urge my readers to check it out as well. They are open for lunch and dinner, and even have an outside patio during good weather. They also serve Brunch on Saturday and Sunday, and that menu looks very interesting too, especially as they make all of their own croissants. And you can get a Croque Madame, which is a Croque Monsieur with a fried egg atop it! Since its inception during the summer of 2008, Tavolo’s weekly “regional pasta tour” has struck a chord with local diners. They have enjoyed the authentic regional Italian recipes they can sample on small plates, they appreciate the chance to sit communally with their Ashmont area neighbors over a glass of vino, and they especially like the price (still just $18). Subtitled “Chris and Max’s Excellent Adventure,” chefs Chris Douglass and Maxwell Thompson exhibit their versatility in exuberant fashion, creating a 3-course meal of recipes that span all 20 regions of Italy, rotating from north to south then north again. $8 half-flights of regional wine elevate the experience; it’s a midweek Italian vacation. I was disturbed when reading a recent article that stated: "New poll results reveal that the majority of Massachusetts voters oppose repealing the alcohol tax." Is that truly the case? Do our citizens enjoy paying taxes, especially on an item that a year ago was tax-free? Effective August 1, 2009, a 6.25% tax went into effect on all alcohol sales. Alcohol had previously been free of tax so this was a drastic change. The new tax has adversely affected a number of wine stores, causing a number of people to now buy their alcohol in tax-free New Hampshire. Rather than increasing taxes on alcohol, the state government should have been doing more to cut waste. Efforts to repeal the alcohol tax were underway soon after the law was enacted, if not beforehand. The repeal initiative gathered a sufficient number of signatures but the Massachusetts Legislature chose not to approve it by the May 4, 2010 deadline. So now sufficient signatures must be obtained by July 7, 2010, to try to get the matter on the ballot for November. But even if the repeal measure makes it to the ballot, will the citizens of Massachusetts support the repeal? The Campaign for Addiction Prevention, Treatment, and Recovery recently retained Anderson Opinion Research of Boston to conduct a poll for them. The poll, conducted May 3-5, reached 450 likely voters, and 58% were against repealing the alcohol tax while 36% supported the repeal and 6% were undecided. 72% of Democrats opposed the repeal while only 50% of the Republican opposed it. The poll also concluded that the majority of people would support a ballot question to lower the state sales tax from 6.25% to 3%. The Campaign for Addiction Prevention, Treatment, and Recovery wants the alcohol tax money to go to a fund for treatment of substance abuses. The tax will supposedly generate $50-$100 million. So they do have a vested interest in this matter, desirous of the revenues to help their cause. But, Suffolk University and 7News conducted their own poll of 500 registered voters and the results were very different, that 48% of the people supported repealing the alcohol tax, 43% opposed it and 9% were undecided. So why the different results from the polls? Partially it may depend on the question that was asked of the respondents. It may also depend on the demographics of the respondents, information that I do not have presently. These were also small sample sizes. I question their accuracy, but it is worrisome that maybe plenty of citizens do oppose a repeal. But why do they oppose it? Their rationale is not explained in these polls. Do they feel the added price helps to reduce underage drinking? Do they feel it is a justified "sin tax?" Do they feel the money is necessary for funding the treatment of alcohol-related diseases? Does the opposition primary consist of non-drinkers? I just don't understand why people who buy alcohol frequently would want to maintain the tax. I think the alcohol tax should be repealed. I think our economic situation would be better because of it. What do you think? What will President Barack Obama think about Saké? We might found out in November. And why is that so? As Saké consumption in Japan has been declining for years, it is always good to hear hopeful news. A recent article in The Japan Times Online, "Presence of Sake Grows in Diplomacy," provided such good news. When the Foreign Ministry of the Japanese government held banquets for foreign dignitaries, they used to serve mainly wine. Wine was considered easier to handle as well as easier to pair with food. Plus it was something foreign dignitaries were familiar with, and would enjoy. But Saké has begun to be served more at these dinners, promoting this national treasure. I think that is a great idea, to spread the love for this special ambrosia. Between 2005 and 2009, the Foreign Ministry bought 2,500 bottles of wine worth about $149,000 and only 737 bottles of Saké, valued at about $21,000. The regular use of Saké at formal functions got a major boost at the Group of Eight summit in July 2008. The dignitaries toasted with Saké and this tradition has started to catch on to other banquets and celebrations. This is not contained to just events within Japan as Japanese diplomatic missions overseas have also been heavily promoting Saké. They have participated in the organization of large-scale Saké tastings in places such as London, Sydney and The Hague. This will hopefully lead to a larger audience worldwide for Saké. President Barack Obama may have his opportunity to drink some Saké at the summit of the Asia-Pacific Economic Cooperation forum to be held in Yokohama in November. If Saké continues to be served at their goverment functions, then President Obama may lift an ochoko, toast "Kanpai" and drink some Nihonshu. What will the President think about Saké? Forget about the burning hot Saké you might have once tried at some cheap Chinese restaurant! Instead, come and learn the myriad joys of chilled Saké. Don't feel intimidated any longer from Saké. Let me try to make it easy for you to understand. On July 15, from 6pm-8pm, I will be teaching "Chilling with Saké," an introductory class to discuss the world of Saké, from its history to how it is brewed. You will learn about the various types of Saké, from Sparkling Saké to Daiginjo. And you’ll taste some interesting Sakés, seeing the range of its flavors and styles. The class will be held at the Boston Center for Adult Education (BCAE) and you should sign up for the course here. The class is limited to 16 people so don't be shut out and sign as soon as possible. If you have any questions about the class, feel free to leave a comment here or email me. The former North End Scene magazine is now known as Scene Boston, and will cover much more than just the North End. The contents will span all across Boston and the first issue has now been published. My restaurant review of Gennaro’s 5 North Square was published in this issue, and you will find a slightly different version below, what was originally submitted before being looked over by the editors of the magazine. Some of the best restaurants are located off the beaten path, away from the popular and heavily traveled streets. In the North End, you will find several such hidden treasures once you leave the main tourist areas. One such treasure is less than a year old, and I almost hesitate to recommend it so that it can remain one of my special secrets. But I must speak up. In May 2009, Gennaro’s 5 North Square opened its doors, under the ownership of the same owners of Caffe Vittoria and Florentine Cafe. They named the restaurant after their son. The building had once been a bank and had been a different restaurant before they took over. They extensively renovated the restaurant and did an excellent job. The restaurant has two floors and the downstairs dining area is small and casual with floor to ceiling windows looking out into the North Square. The upstairs area is larger, seating about 65 people, and is more elegant with marble-topped tables, leather booths, and a mirrored wall section. There are large bay windows that look down into the square and you can even see the Commerce building in the distance. The upstairs would be a great place for a romantic dinner or to impress a client. You might want to begin your meal with a cocktail such as a mojito or margarita. I would suggest though checking their wine list, which has almost twenty wines available by the glass ($7-$12). There are over forty wines available by the bottle, averaging in the $30s. Most of the wines are Italian, with plenty of good choices. I highly recommend the 2005 Rocca Delle Macie Chianti Classico Riserva, ($48/bottle), which is everything you want in a fine Chianti. It is rich, complex and a perfect match with food. Gennaro’s is open for lunch and dinner. The lunch menu is very reasonably priced with plenty of options from antipasti to sandwiches. I would recommend their pizza, which has a nice, thin crust and plenty of tasty cheese and fresh ingredients. This is the type of pizza that really pleases me and it would be easy to eat the entire pizza on my own. The prices on their dinner menu are also reasonable, with twelve choices of Antipasti and Insalate ranging from $8-$14 and 20 different Entrees from $17-$32. Most of the menu is very traditional, which is not a negative when the dishes are prepared as well as they are here. You won’t go wrong with anything you order. Prior to your meal arriving, you can enjoy slices of Italian bread with a Tuscan white-bean dip. The dip also contains olive oil, rosemary, and lots of garlic. It is very creamy and both the garlic and rosemary are very distinctive. Why not then begin your dinner with some antipasti? A perfect choice is the Prosciutto Roulade, a blend of golden fig puree, goat cheese, and toasted pecans rolled in prosciutto and drizzled with a balsamic glaze. These are absolutely delicious and addictive, a perfect combination of salty and sweet, creamy and crunchy. The Fried Calamari are very tender and served with marinara and sweet chili dipping sauces. The sweet chili sauce really delivers, with sweetness upfront and heat that builds in your mouth afterwards. I could think of many uses for that sauce. The Antipasto is packed with roasted tomatoes, prosciutto, Italian salami, fresh mozzarella, marinated olives and mushrooms, grilled calamari, other cheeses and is drizzled with a balsamic vinegar. The freshness of the ingredients impressed me, as did the freshness in all of the dishes I tasted. Such freshness shows a concern and passion for the food. The Seared Tuna is nestled beside spinach, sweet balsamic onion salad and sliced cherry tomatoes. The tuna is lightly seared and spiced on the outside with a raw interior, the quality tuna being silky smooth, melting in my mouth. The Eggplant Napolean is also very good, lightly battered and tender eggplant layered with ricotta and topped with marinara. I should also note that several of the dishes had a delicious, home-made balsamic glaze which added a rich sweetness. Entrees are compelling, including pasta, seafood and meat dishes, something for everyone. Try the traditional Lasagna, which is thick and heavy, loaded with fresh pasta and ricotta. Even a simple dish like Spaghetti and Meatballs is delicious, with two, large and flavorful meatballs and a mound of pasta perfectly cooked al dente. Gennaro’s red sauce is very good, with just the right balance of sweetness and acidity. Their white sauce, with white wine and butter, is also quite good. The Fruita di Mare comes with your choice of red or white sauce, and the white sauce was a perfect accompaniment to all of the seafood, including calamari, shrimp, mussels, scallops and claims. The sauce was clean, light and buttery. The Grilled Swordfish was moist and flavorful, served atop a creamy parmesan risotto with caponata veggies and a light tomato broth. For the carnivore in you, opt for the Rack of Lamb, several roasted lamb chops topped by mint basil pesto with roasted potatoes and autumn vegetables. The tender, meaty chops were succulent, and the mint flavor was very subdued and did not overwhelm. This was a hearty dish, and perfect for a New England winter evening. If you are not already stuffed from dinner, you can enjoy some dessert. There is a full list of after dinner drinks, including ports, grappa, coffees, and cordials. Dessert choices include items like Tiramisu, Cannoli, Spumoni, and Sorbet. The traditional Cannoli is a fine and good-sized choice, a crunchy shell filled with a creamy blend and accompanied by whipped cream and chocolate sauce. The Molten Chocolate Cake, moist and fudgy, comes with vanilla ice cream and whipped cream and could easily be split by two people. Service was excellent, our server being personable and attentive. It is a family-owned business where the guests feel like part of their family. It is perfect for both a casual meal or a more intimate dinner. I heartily recommend Gennaro’s 5 North Square as a restaurant for reasonably priced and delicious Italian fare. Mix all ingredients for filling, add to crust and cook for about 20 minutes. Let cool. *Västerbotten cheese (Västerbottensost) is a cheese from the Västerbotten region of Sweden. It is a hard cow's milk cheese with tiny eyes or holes and a firm and granular texture. As in Cheddar cheese, the curd is heated, cut, and stirred before the cheese is molded and aged. Strong in flavor, its taste is described as somewhat like Parmesan cheese, salty, but with more bitter notes. It is light yellow in color and has a fat content of 31%. Some Swedish people consider it the king of cheese and demand for it has often outstripped the limited supply. This cheese must be aged for at least 12 months, but 14 months is more common. Beacon Grille is one of the newest restaurants in Woburn, located just off Rt.128 at the Tradecenter 128. It is an unusual restaurant in that 100% of their net profits are donated to the Cummings Foundation, Inc., a charitable organization. There are plenty of restaurants that donate to charities, yet I am unaware of any other restaurant that donates so much of their profits. The restaurant is part of Cummings Properties, which designed, engineered, built, and operates the entire TradeCenter 128 complex. It also is eco-conscious, engaging in numerous Green Policies, as well as trying to buy as much locally as possible. There is much to admire about the restaurant, yet the bottomline is always the quality of the food. No matter how charitable or green a restaurant, the primary question is always "is the food good and worth your money?" My current answer is "Yes." I have eaten lunch twice at the Beacon Grille, and have enjoyed most of the food, and I will be returning soon to check out their dinner menu. First, it is an elegant and beautiful restaurant, with plenty of dark wood and marble. The bar is quite large, seating about 90 people. There is an open kitchen and though the restaurant seems fancy, it lacks any pretension. It certainly would be a great place for a romantic date, a business meeting, or even a family meal. The lunch menu includes Starters ($6-$13), Soups, Chowders & Salads ($4-$15), Vegetarian ($13-$16), Entrees ($13-$38), and Sandwiches ($9-$17). There are usually some specials of the day too. You can generally substitute any sides for vegetable of the day, rice medley, mashed potatoes, French fries, sweet potato fries, small salad, or cole slaw. Basically everything I ordered seemed reasonably priced, though there are a few high priced items on the menu, generally the better steak selections. On my initial trip to the restaurant, I received a basket of warm bread with butter, a variety of delicious breads. That always puts me in a good mood. Unfortunately, on my second trip, I did not receive, and was not offered, any bread. Though I later saw other tables had received bread. I tried several of the different Starters, wanting to get a feel for the restaurant, as well as to get a variety of tastes. The Pulled Pork Rangoon ($10), pictured above, consists of hand pulled pork mixed with South American flavors and wrapped in wonton skins. These were pretty good, with a nice, crispy wonton shell and a moist, creamy interior. I was expecting the pork to be a bit firmer but it was more of a paste. It had a decent flavor, though not what I expected. The Beacon Onion Rings ($6) are Jumbo-sized onion rings, hand-breaded and lightly fried. They certainly are jumbo, quite large rings with a light, crispy breading and sweet onion inside. You only receive about six onion rings, but each one is the size of many smaller ones. An excellent choice if you love onion rings. The Thai Chicken Tenders ($7) are crispy fried chicken tenders tossed in a sweet and spicy Thai chili sauce. These were meaty and tasty, though the sauce tended on the sweet side rather than the spicy side. I would have liked a bit more spicy heat in the sauce. The chicken was cooked very nicely and there was plenty of it. The Lobster Mac n’ Cheese ($13) has tiny pasta shells and fresh Maine lobster in a creamy cheese sauce with Panko topping. Though the mac n' cheese part was fine, there was little lobster to be found. So this was not a dish that really satisfied as it should. On the other hand, the Lobster Bisque ($8), a creamy, highly seasoned soup with Maine lobster pieces, finished with a hint of sherry, had a decent amount of lobster pieces in it. If the mac n' cheese had the same amount of lobster, I might have been satisfied. The bisque had an excellent flavor, being neither too thin or thick. It was creamy and full of flavor, and I would certainly order it again. One of the lunch Specials was a Prime Rib French Dip with Swiss cheese and sweet potato fries. A top notch sandwich with tender, thinly sliced prime rib atop fresh, soft bread accompanied by some au jus. The above photo shows only one half of the sandwich. If this sandwich is an indication of the quality of their beef, then I eagerly look forward to checking them out at dinner. Plus, the sweet potato fries were excellent, one of a handful of restaurants that really gets them right. Crispy outside, soft and flavorful inside. Addictive! The Innkeeper’s Melt ($11) has shaved roasted prime rib atop sliced Italian bread with barbeque sauce and Swiss cheese. It was a very good sandwich too, just not as good as the French dip. I think the prime rib for the French dip was a bit thinner, and more tender. But, I did like this sandwich and would order it again if the French Dip was not a special. The Baldwin Burger ($9), is a half-pound USDA Choice Black Angus burger with your choice of two toppings: Applewood bacon, sautéed onions, mushrooms, roasted peppers, American, cheddar, Swiss, feta, or blue cheese. This is a meaty and tasty burger, and a good choice for a lunch sandwich. A more unusual, and very compelling, Entree is the Rice Paper Salmon Rolls ($13), which are crispy seared salmon wrapped in rice paper, served with a side of roasted peach mango cucumber chutney, wasabi soy dipping sauce and herb rice croquettes. The rolls were superb, with a excellent blend of textures and flavors, and lots of salmon. The croquettes were also very good, with a crunchy coating and a creamier interior. A highly recommended dish! For dessert, a decadent and recommended choice is the huge Baldwin Ice Cream Sundae ($5.95), which has three scoops of Brigham’s vanilla bean ice cream smothered with caramelized fresh sliced apples and their own butterscotch, plus fresh whipped cream and crushed candied pecans. This is a dish you can easily share, and everyone else with you will want some. A nice blend of flavors, it is different from the usual hot fudge sundae, and that is a good thing. Service was generally excellent, except for not getting any bread on my second visit. Much of the food is very good and reasonably priced, and I like the restaurant's charitable and eco-friendly philosophy. As a lunch spot, it does very well, and I look forward to checking it out for dinner. Chef-Owner Paul O'Connell of Chez Henri has scheduled some delicious and fun events for the summer. Chef-Owner O’Connell was an early proponent of biodynamic wine and has had them on the wine list at his Harvard Square bistro since 2006. He is adding several new ones he’s impressed with. O’Connell and another Boston chef (TBD) will compete in a two-day cook-off of summer recipes, with complimentary samples for all. This Bon Appetit magazine sponsored event takes place at The Natick Collection on August 14 and 15 from 9 AM til 6 PM. There is no cost. Following a very brief shut down for renovations, Chez Henri will kick off its gala 15 Year Birthday (known as a quinceanero in Latin America) with a series of blowout dinners featuring “alumni” chefs who have gone on to fame and fortune after leaving the Chez Henri kitchen. Guest cooks will be named soon. The Greek island of Santorini might have been the inspiration for the legend of Atlantis. About 3600 years ago, the island sustained an enormous volcanic eruption, which left a large caldera surrounded by volcanic ash deposits. The resulting tsunami may have contributed to the legend of the destruction of Atlantic by a great flood. The SantoWines Winery is located on Santorini, on the edge of the caldera, and is the biggest wine producer on the island. Established in 1992, the winery cultivates about 4000 acres of vineyards. "SantoWines, representing all the cultivators of the island, is committed to producing authentic Santorini wines of superior quality while respecting the Santorini traditional vinification techniques, protecting the precious Santorini vineyard and its sustainable development." With dinner the other evening, I opened a bottle of the 2008 SantoWines Assyrtiko. It is made from 100% Assyrtico, sees no oak and has an alcohol content of 12.8%. Last year, I had the 2007 vintage of this wine, and had enjoyed it. The 2008 vintage brought a similar wine in most ways. It had a bright yellow color and a pleasant nose of citrus. On the palate, it was crisp and clean with bright citrus, especially lemon and tangerine, and hints of minerality. I think the 2007 had more minerality than the 2008. The 2008 had a lengthy and satisfying finish, and I really enjoyed the wine. I paired the wine with some lightly broiled tilapia and it went very well together. This is definitely a wine that pairs well with seafood, though I think the wine can stand fine on its own as well. Ashmont's Grill's backyard patio is now open and you'll find it shady by day and it twinkles by night, with subtle strung lighting, now augmented by spot-lit trees. Its private nature is conducive to an alfresco romantic dinner. Ashmont Grill's pastry chef Clare Garland has launched a dessert feature called Sundae of the Month. Ice cream flavors and toppings vary, but the base is a fudgy constant: a gigantic, retro brownie. For June, it’s Rocky Road Sundae: Coffee ice cream with hot fudge sauce, homemade marshmallow “fluff” and chopped hazelnuts over a brownie ($8). Garland also offers a weekly Baker’s Whim, a selection of three mini-desserts on one plate. This week features Malted Milk Ball Ice Cream Truffles, Caramel Pot de Crème and Almond Biscotti ($8). Garland’s old fashioned fruit cobblers are always in tune with the local farmer’s market, and during June she’s excited about her Blackberry-Nectarine Cobbler ($8). If citrus appeals, her Frozen Key Lime Pie is back for summer ($8). The late spring is a joyous time as the wine stores start carrying lots of Rosés. Though I enjoy drinking Rosé year round, for many it is primarily a summer drink. So it can be hard to find in the fall/winter yet the summer time brings a deluge of Rosé to the market. So when it becomes available, I am always trying new ones, such as the 2009 Gai'a 14-18h Rosé ($15). You should do the same and try some new Rosé. Gai'a Wines, S.A. is a Greek wine producer and you can read more information about them, including some reviews of their other wines, either here or here. The 2009 Gaia 14-18h Rosé is made from 100% Agiorgitiko, the St. George grape. Its name derives from the fact that this wine has 14-18 hours of skin contact, which gives it a rich pink color. It has an alcohol content of 12.5% and a bright nose of red fruits. It is a very dry Rosé, definitely Old World in style, with restrained but definite flavors of strawberry, watermelon and cherry. It is a very crisp and refreshing wine, perfect for a summery day. It should prove to be very food friendly, from some broiled scallops to some grilled lamb. I actually drank it with grilled burgers and hot dogs and it was fine with them. I bought this wine at the Wine Bottega, which has a good selection of Rosé. My new column of "A Passionate Foodie" can be found in the June 9 issue of the Stoneham Sun newspaper. This is a weekly column that concentrates on reviews of local restaurants though it also sometimes touches on other food and wine topics. The new column has been published today and will be available online soon. The new article is a restaurant review of Savinos Grill in Belmont, which serves Italian Mediterranean cuisine. They make some excellent seafood and the chef seems to use very fresh ingredients. It is well worth checking out, and is located across from The Spirited Gourmet wine store. Rant: Are Children That Picky?